Fall is one of my favorite seasons, and it’s the perfect time to make some delicious comfort food! 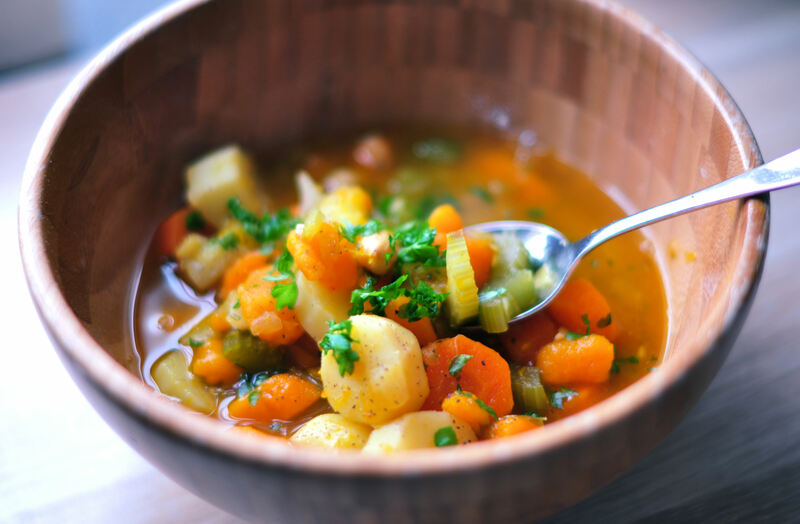 So now that the weather is getting colder, what could be better than a big bowl of steaming soup FULL of flavors and textures? I’ve basically been eating this soup every day for about a week now, it is that good! 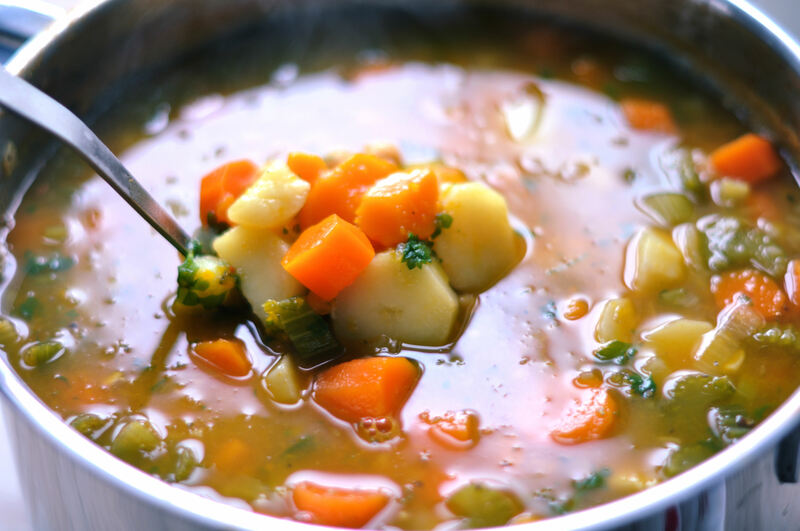 This makes a BIG pot of soup, which is both extremely helpful on busy days (all you got to do is reheat), and is also super budget friendly. I like to have a bowl of quinoa or rice on the side, this way the soup will last you even longer. Also I want to add that you don’t have to use ALL the ingredients in this soup (I realize it looks like quite a lot, but trust me it’s not that bad). You can definitely leave some things out if you don’t have them on hand, or you can sub other ingredients. First chop the onion and garlic. Set aside. Then peel and cut potatoes and carrots into chunks. They should be about the same size. Also cut the skin of the pumpkin, and cut it in larger chunks than the potatoes and carrots (as it cooks really quickly). Also chop the spring onion and celery. Sauté the onion and garlic in water/oil (use a big pot) about 5 minutes until soft. Then add the potatoes, carrot, pumpkin and spices. Then add water/stock until it just covers the vegetables. Finally add bay leaf and fresh rosemary. Bring to a boil. When it’s boiling add the spring onion and celery. Turn heat down and let the whole thing simmer for about 15-20 minutes, until all the vegetables are nice and tender. Rinse your chickpeas and chop your parsley – add it all in, and stir. Taste test! (don’t burn your tongue) Maybe you want to add a little more spice or some salt. 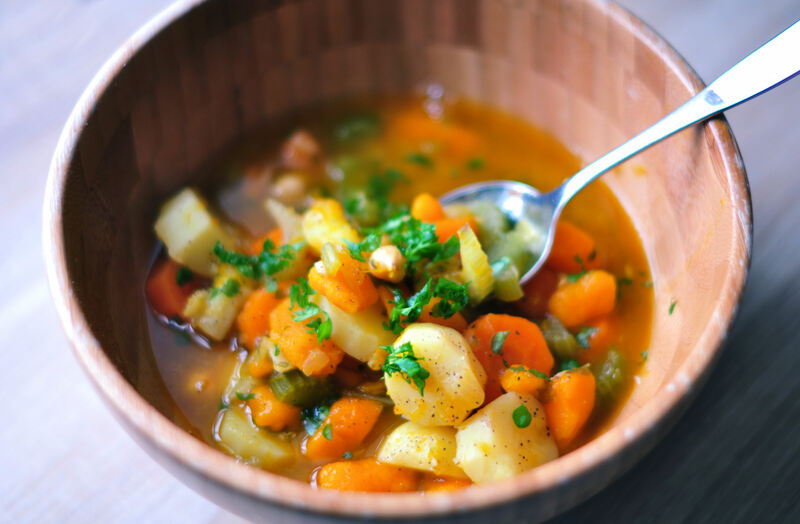 Let your soup cool down a little before serving (enhances flavor). If you want you can top it with some freshly cracked pepper, and additional chopped parsley.